Sorry... the 2017 Toyota Corolla is no longer being sold as new. 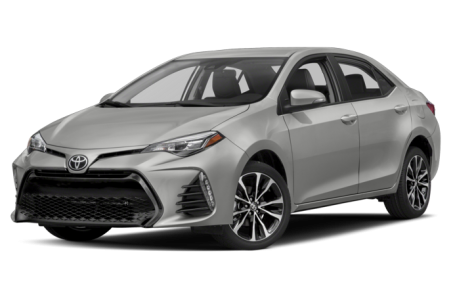 Instead, take the first step to a great deal on 2020 Toyota Corolla with a free price quote! The 2017 Toyota Corolla is a popular compact sedan that seat 5 passengers. It competes with the Honda Civic, Nissan Sentra, and Ford Focus. This year, a special 50th Anniversary Edition Package is available. The Corolla receives a revised front-end that includes a wider, “mandible-mouth” fascia. Horizontal strakes at the outer air vents also give the Corolla a more aggressive look. Standard features include LED headlights and power side mirrors. Available features front fog lights, heated side mirrors, turn signal indicators at the side mirrors, and larger 16- or 17-inch alloy wheels. The 50th Anniversary Edition has three exterior color options: Black Cherry Pearl, Classic Silver, and Blizzard Pearl. Under the hood, the Corolla is powered by a standard 132-hp, 1.8-liter 4-cylinder engine mated to a 2-speed continuously variable automatic transmission (CVT) or a 6-speed manual. The LE Eco is tuned to produce 140-hp with the same engine. Fuel economy for the Corolla CVT is an EPA-estimated 29/38 mpg city/highway. It lower slightly to a 28/37 mpg rating for the Corolla Manual. The LE Eco has a marginally better 30/42 mpg rating. Inside, the Corolla features a standard cloth interior with front bucket seats and a 60/40 split-folding rear seat. The center stack features a standard Entune multimedia system with a new 7-inch touchscreen, Bluetooth connectivity for phone and audio, and a USB port. It can be upgraded with an integrated navigation system, Apple CarPlay/Android Auto, and a premium audio system. Standard features include air conditioning, power windows/locks, and cruise control. Available features include dual-zone automatic climate control, a leather steering wheel, power/heated front seats, a power moonroof, push-button start, and remote keyless entry. The 50th Anniversary Edition has a premium black cloth interior with Black Cherry piping and contrast stitching. Standard safety features include a backup camera and tire pressure monitoring system. The available Toyota Safety Sense-P Package comes with adaptive cruise control, lane departure warning, collision prevention system, automatic emergency braking, and pedestrian detection. 201 of 205 (98%) consumers said they would recommend this vehicle to a friend.